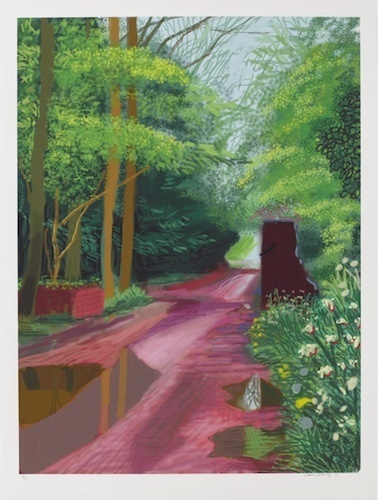 David Hockney, The Arrival of Spring in Woldgate, East Yorkshire in 2011 (twenty-eleven)-11, May, 2011, iPad drawing printed on paper, 55 x 41 1/2". In recent years, David Hockney has turned to the walkways around his studio in East Yorkshire, England, where he has set his latest series, “The Arrival of Spring.” Hung according to medium, it begins with stark black-and-white charcoal drawings, which are followed by a multiscreen video installation that depicts winter in all its severity. The series culminates in vivid prints drawn on an iPad, illustrating the verdancy of spring. Pathways center every work, with the exception of 4 May 2011, in which a large tree halts our perambulation in an overgrown field populated by wildflowers. Though each work is titled by date, a sense of linear temporal progress is misleading as the iPad works were made a year before the black-and-white winter scenes. The titles announce this disparity, signally the way seasons structure memory. We imagine that we are moving toward spring, but in fact we turn out to be indulging reflections of years past. Spatiotemporal disorientation most commonly reminds of the human relationship to the urban geographical terrainthe flâneur sauntering in Charles Baudelaire’s Paris or Guy Debord’s derive, an unplanned drifting while responding to psychological contours of the city. Hockney emphasizes our encounter with the pastoral landscape as more than ever distant and mediated by technology. Calling attention to the haptic nature of drawing, technology highlights the tenuousness of the artist’s touch, being at once present and absent in the iPad prints. A parallel interplay with the embodied landscape occurs in Woldgate Woods, November 26th 2010, a point-of-view video installation in which nine screens present a snowy drive. Immersed in the blinding white of winter, slightly different camera angles allow the video to unfold as expansively as the drawings. Hockney manages to integrate different media and styles into a conceptual framework that invigorates landscape, a genre that too often struggles to be daring.